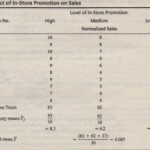 Returning to the data of Table 16.2, let us now examine the effect of the level of in-store promotion and couponing on store sales, The results of running a 3 x 2 ANOVA on the computer are presented in Table 16.5. For the main effect of level of promotion, the sum of squares SSxp degrees of freedom, and mean square MSxp are the same as earlier determined in Table 16.4. 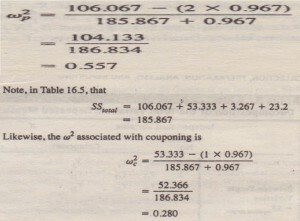 The sum of squares for couponing SSxc = 53333 with 1 df, resulting in an identical value for the mean square MS xc: The combined main effect is determined by adding the sum of squares due to the two main effects (SSxp + SSrc = 106.067 + 53333 = 159.400) as well as adding the degrees of freedom (2 + 1 = 3). For the promotion and coupon interaction effect, the sum of squares SSxpxc = 3.267 with (3 – 1) (2 – 1) = 2 degrees of freedom, resulting in MSxpxc = 3.267/2 = 1.633. 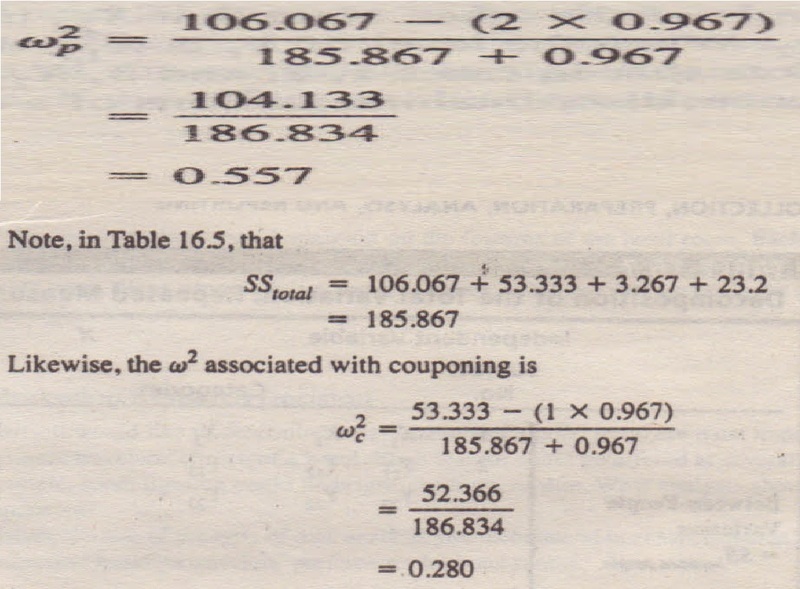 For the overall (model) effect, the sum of squares is the addition of the sum of squares for promotion main effect, coupon main effect, and interaction effect = 106.067 + 53333 + 3.267 = 162.667 with 2 + 1 + 2 = 5 degrees of freedom, resulting in a mean square of 162.667/5 = 32.533. Note, however, the error statistics are now different than in Table 16.4. This is due to the fact that we now have two factors instead of one. SS.nor = 23.2 with (30 – 3 X 2) or 24 degrees of freedom resulting in MSerror = 23.2124 = 0.967.
with I and 24 degrees of freedom, which is significant at the 0.05 level. Thus, a higher level of promotion results in higher sales. The distribution of a store wide coupon results in higher sales. The effect of each is independent of the other. If this were a large and representative sample, the implications are that management can increase sales by increasing in-store promotion and the use of coupons, independently of the other. A study examined the impact of country affiliation on the credibility of product-attribute claims for TVs, The dependent variables were the following product-attribute claims: good sound, reliability. crisp-clear picture, and stylish design. The independent variables that were manipulated consisted of price. country affiliation, and store distribution. A 2 x 2 x 2 between-subjects design was used. Two levels of price. $949.95 (low) and $1,249.95 (high). two levels of country affiliation. Korea and the United States. and two levels of store distribution. Best Buy and without Best Buy. were specified. Data were collected from two suburban malls in a large U.S, city. Thirty respondents were randomly assigned to each of the eight treatment cells for a total of 240 subjects. Table I presents the results for manipulations that had significant effects on each of the dependent variables. investments in the United States. Specifically. three product attribute claims (crisp-clear picture, reliability, and stylish design) are perceived as more credible when the TVs are made in Korea if they are also distributed through a well-known U.S. retailer. Also. the “good sound” and “reliability” claims for TVs are perceived to be more credible for a U.S-made set sold at a higher price. possibly offsetting the potential disadvantage of higher manufacturing costs in the United States. Thus. Thomson. the manufacturer of products may be better off manufacturing its TV sets in the United States and selling them at a higher price. • In determining how consumers’ intentions to buy a brand vary with different levels of price, attitude toward the brand may have to be taken into consideration. • In determining how different groups exposed to different commercials evaluate a brand, it may be necessary to control for prior knowledge. • In determining how different price levels will affect a household’s cereal consumption, it may be essential to take household size into account. The significance of the combined effect of the covariates, as well as the effect of each covariate, is tested by using the appropriate F tests. The coefficients for the covariates provide insights into the effect that the covariates exert on the dependent variable. Analysis of covariance is most useful when the covariate is linearly related to the dependent variable and is not related to the factors. 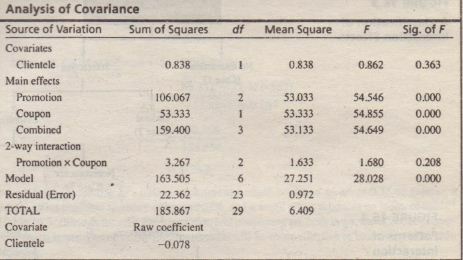 We again use the data of Table 16.2 to illustrate analysis of covariance. Suppose that we wanted to determine the effect of in-store promotion and couponing on sales while controlling for the effect of clientele. It is felt that the affluence of the clientele may also have an effect on sales of the department store. The dependent variable consists of store sales. As before, promotion has three levels and couponing has two. Clientele measured on an interval scale serves as the covariate. 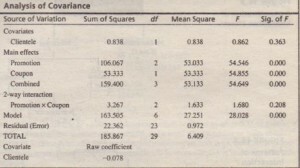 The results are shown in Table 16.6. As can be seen, the sum of squares attributable to the covariate is very small (0.838) with 1 df resulting in an identical value for the mean square. The associated F value is 0.838/0.972 = 0.862, with I and 23 degrees of freedom, which is not significant at the 0.05 level. Thus, the conclusion is that the affluence of the clientele does not have an effort 011 the sales of the department store. 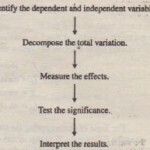 If the effect of the covariate is significant, the sign of the raw coefficient can be used to interpret the direction of the effect on the dependent variable. Important issues involved in the interpretation of ANOVA results include interactions, relative importance of factors, and multiple comparisons. The different interactions that can arise when conducting ANOVA on two or more factors are shown in Figure 16.3. One outcome is that ANOVA may indicate that there are no interactions (the interaction effects are not found to be significant), The other possibility is that the interaction is significant, An interaction effect occurs when the effect of an independent variable on a dependent variable is different for different categories or levels of another independent variable. The interaction may be ordinal or disordinal. In ordinal interaction, the rank order of the effects related to one factor does not change across the levels of the second factor. Disordinal interaction, on the other hand, involves a change in the rank order of the effects of one factor across the levels of another. If the interaction is disordinal, it could be of a non crossover or crossover type. These interaction cases are displayed in Figure 16.4, which assumes that there are two factors, X1 with three levels (X11 X12, and X13), and X2 with two levels (X21 and X22). 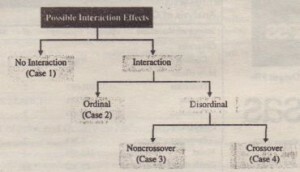 Case 1 depicts no interaction. The effects of X1 on Y are parallel over the two levels of X2 Although there is some departure from parallelism, this is not beyond what might be expected from chance. Parallelism implies that the net effect of X22 over X21 is the same across the three levels of X1 In the absence of interaction, the joint effect of X1 and X2 is simply the sum of their individual main effects. Case 2 depicts an ordinal interaction. The line segments depicting the effects of X1 and X2 are not parallel. The difference.between X22 and X21 increases as we move from X11 to X12 and from X12 to X13, but the rank order of the effects of X1 is the same over the two levels of X2 This rank order, in ascending order, is X11 XJ2, XJ3, and it remains the same for X21 and X22. Dis-ordinal interaction of a non-crossover type is displayed by case 3. The lowest effect of X1 at level X21 occurs at X11 and the rank order of effects is X11 ,X12, and X13 However, at level X22, the lowest effect of X1 occurs at X12, and the rank order is changed to X12, X11 and X13 Because it involves a change in rank order, dis-ordinal interaction is stronger than ordinal interaction. 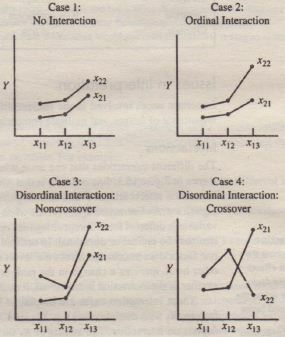 In dis-ordinal interactions of a crossover type, the line segments cross each other, as shown by case 4 in Figure 16.4. In this case, the relative effect of the levels of one factor changes with the levels of the other. Note that X22 has a greater effect than X21 when the levels of XI are X11 and X12. When the level of X1 is X13, the situation is reversed, and X21 has a greater effect than X22 (Note that in cases 1,2, and 3, X22 had a greater impact than X21 across all three levels of X1) Hence, dis-ordinal interactions of a crossover type represent the strongest interactions. As a guide to interpreting w², a large experimental effect produces an w² of 0.15 or greater, a medium effect produces an index of around 0.06, and a small effect produces an index of 0.01.18 In Table 16.5, although the effect of promotion and couponing are both large, the effect of promotion is much larger. Therefore, in-store promo will be more effective in increasing sales than couponing. 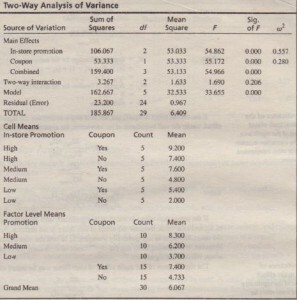 The ANOVA F test examines only the overall difference in means. If the null hypothesis of equal means is rejected, we can conclude only that not all of the group means are equal, However, only some of the means may be statistically different and we may wish to examine differences among specific means. This can be done by specifying appropriate contrasts, or comparisons used to determine which of the means are statistically different. Contrasts may be a priori or a posteriori. A priori contrasts are determined before conducting the analysis, based on the researcher’s theoretical framework. Generally, a priori contrasts ere used in lieu of the ANOVA F test. The contrasts selected are orthogonal (they are independent in a statistical sense). A posteriori contrasts are made after the analysis. These are generally multiple comparison tests. They enable the researcher to construct generalized confidence intervals that can be used to make pairwise comparisons of all treatment means. These tests, listed in order of decreasing power, include least significant difference, Duncan’s multiple range test, Student-Newman-Keuls, Tukey’s alternate procedure, honestly significant difference, modified least significant difference,Band Scheffe’s test. 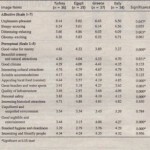 Of these tests, least significant difference is the most powerful; Scheffe’s, the most conservative. For further discussion on a priori and a posteriori contrasts, refer to the literature. Our discussion so far has assumed that each subject is exposed to only one treatment or experimental condition. Sometimes subjects are exposed to more than one experimental condition, in which case repeated measures ANOVA should be used. In marketing research there are often large differences in the background and individual characteristics of respondents. If this source of variability can be separated from treatment effects (effects of the independent variable) and experimental error, then the sensitivity of the experiment can be enhanced. One way of controlling the differences between subjects is by observing each subject under each experimental condition (see Table 16.7). In this sense, each subject serves as its own control. For example, in a survey attempting to determine differences in evaluations of various airlines, each respondent evaluates all the major competing airlines. Because repeated measurements are obtained from each respondent, this design is referred to as within-subjects design or repeated measures analysis of variance. This differs from the assumption we made in our earlier discussion that each respondent is exposed to only one treatment condition, also referred to as between-subjects design. 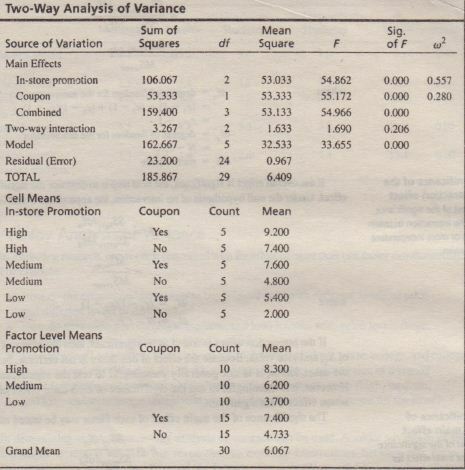 20 Repeated measures analysis of variance may be thought of as an extension of the paired-samples r test to the case of more than two related samples. 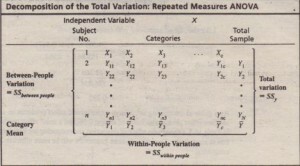 In the case of a single factor with repeated measures, the total variation, with lie – 1 degrees of freedom, may be split into between-people variation and within-people variation. So far we have assumed that the dependent variable is measured on an interval or ratio scale, If the dependent variable is non-metric, however, a different procedure should be used. Marriott International, Inc is a leading worldwide hospitality company. Its heritage can be traced to a small root beer stand opened in Washington, D.C., in 1927 by J. Willard and Alice S. Marriott. As of 2009, the company operated or franchised about 3,000 lodging properties located in the United States and 67 other countries and territories. Among Marriott’s most frequent visitors are its business traveler customers. For many years, business travelers have faced a fundamental problem-figuring out a comfortable and convenient way to get their jobs accomplished in hotel rooms without a functional work space. Though many were not very productive, they did hone important skills such as writing legibly on top of a comforter, stretching arms beyond maximum length to reach hidden outlets behind or underneath furniture, and squinting lightly to make documents readable. Marriott recognized these needs of its business travelers and wanted to do something about it. Susan Hodapp, brand director for Marriott Hotels, Resorts, and Suites, commissioned a survey to determine business travelers’ preferences for hotels and the factors that are important in their hotel selection process. Part of the questionnaire focused attention on the features of the hotel room. Each respondent rated the relative importance of the following factors on a 7-point scale (I = not at all important, 7 = extremely important): room decor, room lighting, room furniture, voice and data access in the room, and price of the room per night. 1. Marriott would like to determine what features of a hotel room are most important in business travelers’ choice of a hotel. Each feature could be offered at several levels, for example, room lighting could be bright, medium, or dim. What analysis should be conducted? 2. Discuss the role of the type of data analysis you recommend in enabling Susan Hodapp to understand business travelers preferences for hotel rooms. 1. What should Marriott do in order to lure the business travelers? What features should it stress?